Today, we filed an amicus curiae brief in the U.S. Supreme Court opposing efforts to have the Court force homosexual marriage on the States and the People. Our firm filed yet another amicus curiae brief in our continuing effort to revitalize and extend the property basis of the Fourth Amendment. Here the case involved applying the Fourth Amendment to protect certain commercial records of hotels — guest registers. Today, our firm filed an amicus brief in the U.S. Supreme Court in support of a challenge to San Francisco’s gun storage and ammunition ordinances. Today our firm filed a Petition for Writ of Certiorari seeking U.S. Supreme Court Review of two decisions of the California Courts which held that the California Secretary of State had no duty to determine whether a candidate for President of the United States is eligible to serve, if elected, before placing his name on the official state election ballot. Today, our firm filed an amicus brief in the U.S. Supreme Court in opposition the Obamacare healthcare “exchanges” created by the federal government contrary to the plain language of the statute. Today, our firm filed an amicus curiae brief in the U.S. Supreme Court, urging that the Fourth Amendment be applied to all searches and seizures of automobiles. We asked the Court to leave no latitude for judges to compromise away the constitutionally-protected civil liberties of Americans to serve the “needs” of law enforcement. Today, our firm filed an amicus brief in the U.S. Supreme Court in the caseJohnson v. U.S., No. 13-7120. In New Jersey, it is a crime to possess a firearm unless you can prove that you fit within one or more tightly-drawn statutory exemptions. One exemption allows a person to have a handgun on his own property, but he may not step one foot beyond unless the gun is fully disabled and he is heading to an approved destination. Today, our firm filed an amicus curiae brief in the U.S. Supreme Court in Abramski v. United States, in a case challenging the Bureau of Alcohol, Tobacco, and Firearms’ (ATF) definition of what constitutes an illegal “straw purchase” of a firearm. This case involves one of the greatest instances of regulatory and prosecutorial abuse that we have ever seen. Today our firm filed an amicus brief in the case of National Labor Relations Board v. Noel Canning, et al. 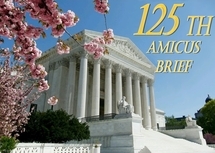 in the United States Supreme Court, in support of the respondents. In this case, the U.S. Supreme Court is considering the scope and limitations of the President’s recess appointment power. Today our firm filed an amicus brief in the case of Howard Wesley Cotterman v. United States in the United States Supreme Court in support of petitioner. Today, our firm filed an amicus brief in the U.S. Supreme Court, in support of a petition for certiorari filed by the National Rifle Association, challenging the federal prohibition against the purchase of firearms by 18-20 year olds. Today our firm filed an amicus brief in the case of Tim Moose v. William Scott MacDonald in the United States Supreme Court in support of petitioner. Today, our firm filed an amicus brief in the U.S. Supreme Court in support of a petition for certiorari challenging Maryland’s “good and substantial reason” requirement for those who apply for a concealed carry permit.